Rather interesting blog post looking at something that would normally get overlooked! In those pre-electricity days, many a public building or public space used gas lamps and some still do. This is Sheffield park Railway Station, back in 2001. The lamplighter is at work, handily by the footbridge which enabled me to get a close up shot from the same height. 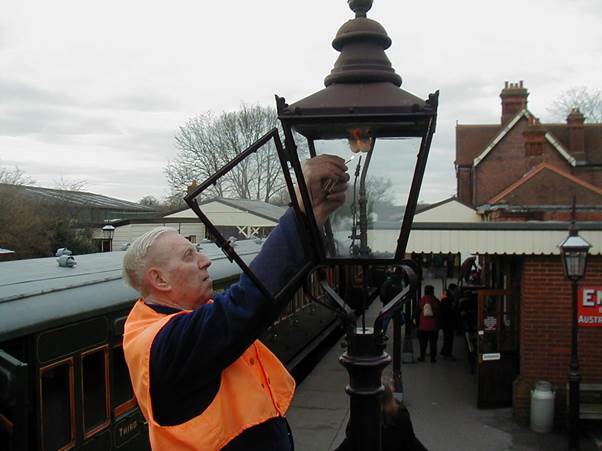 I love this photo for, although it is 21st century and the hi-vis waistcoat almost proves it, it is a reminder of a long ago occupation of lighting and tending gas lamps. This is also a reminder of the kind of job which used to be done by railway porters up and down the country. These little touches add so much to the atmosphere of a heritage railway. It isn’t all about trains or engines.